A quick thank you to everyone who stopped by my shop update yesterday. It was a success and I sincerely thank you! I'll be busy boxing up orders today (and maybe tomorrow) but this weekend I'll be heading to Minneapolis to spend some of that hard-earned loot at No Coast Craft-o-Rama, a super fantastic indie craft show at the Midtown Global Market. I was lucky enough to be a vendor at this show a few years ago and loved it so much I wanted to move in. Seriously. Not only will there be amazing handmade goods but good food and maybe music too. Sometime this week I'm going to try to have a tutorial up for you all to try also so get your birch bark and sturdy sewing needles ready. Thanks again, everyone. Happy Tuesday. Just a few more glimpses of what I'll be adding to my Etsy shop on Monday. For the holidays, poinsettia brooches made of felted garment wool and some pretty fantastic vintage buttons from my collection (I love those rhinestone buttons but hadn't had the right project for them until now). I've brought out several vintage tea cups from my stash and spent some time building nests. I like these as decorations both on the tree and on the wall. I think a grouping of them would be really cute. This is a beautiful Rosenthal china cup that has been fitted with moss, twigs, and a few tiny wool eggs. There will be more styles including Wedgwood, Nippon (with beautiful irridescence), milk glass, and more. and just a few sets of mushroom ornaments, including one collection of plant-dyed specimens, as well as a few apple and pear ornaments. I'll be making gifts for family and friends in the coming weeks and I can't wait to share some of the projects wtih you. 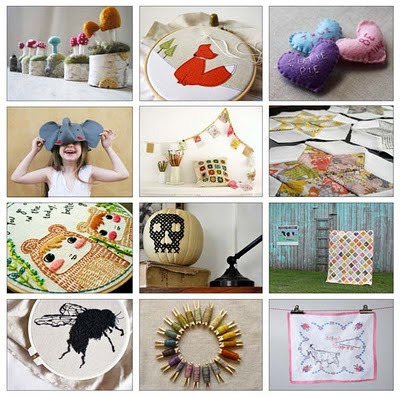 Are you giving handmade this year? 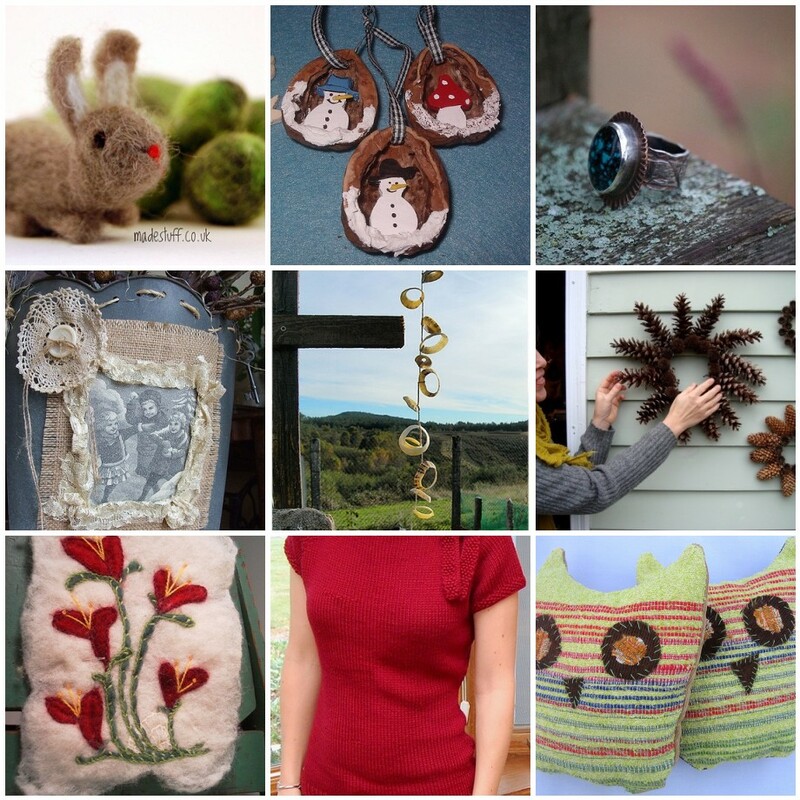 Here's a peek at just a few of the things that I'll be including in my next shop update. These pieces and more (that I haven't photographed yet) will be in my Etsy shop on Monday Nov. 29th at 4pm CST. I'll share photos of some of the other goodies later this weekend. There will be new brooches made of wool and wood. I love the combination of textural wool and smooth wood but I wanted a wood setting that felt natural and organic. I like work that is a little "perfectly imperfect" so as I cut and shaped my wood pieces from an oak limb I salvaged, I drilled the holes off-center and left planes and angles in the wood. They're sanded smooth, but the wood feels like something I might have picked off the forest floor, and I like that. I finished them simply with beeswax. There will be some pieces with scenes from nature and a few that are free-form and inspired by lichen and fungi. There will be a limited number of tiny canoes, strung up with waxed cotton cord for hanging. There will be just a few wool acorns, some for tying on gifts (or hanging in the tree) and some with rusty caps, all of which will have a special price. There will be some birch bark birch leaf tags/ornaments as well with woodburned details. They hang from a soft length of alpaca yarn. This will be my last shop update for 2010. I plan to keep the shop open for a few days afterwards then I'm shutting down the shop for all of December to work on gifts for family and friends. (and to recharge a little) I'll still be here on blog though, so I hope you stop in and see me. Happy Friday, everyone. Have a great weekend. I am thankful for my family who loves me. I am thankful for my healthy, bright, and challenging children. I am thankful to live amongst the trees under strong safe walls. I am thankful for capable hands and a curious head. I am thankful for the gift of friendship. I am thankful for each of you that stop in here to read, for sharing your thoughts and your world with me, and for making me feel understood, connected, and not quite so alone out here in the woods. Thank you, each and every day. A quick peek at what's been in the dye jars lately. ﻿Last week I harvested the last of the parsley that had made it through snow and freezing temps. Hardy stuff, that parsley. I had made a parsley salad but there was so much parsley left over that I had to try dyeing with it. I mordanted the wool with alum and I was suprised to pull a bright pale yellow from the vat. Next up was pomegranate. This wool was also mordanted with alum and it produced an odd slightly mauve-y pink. The color on the wool has faded slightly over the past few days so I question its lightfastness, but the cotton floss is still holding color nicely. It's definitely worth trying again, and next time I think I might spring for a jar of juice rather than dealing with the whole fruit. I love eating pomegranates so much that it was slightly painful to put it in a dye jar rather than my belly. This is the result of my salt water and steel wool pad experiment from last week, on linen. You can see the imprints of the rusty steel but the entire piece has a slight orangey color. It looks quite lovely when held to the light. I'd love to try wrapping fiber around rusty objects like fence posts and hardware, to see what happens. I also used some carrot peelings, left over from one night's dinner, and they yielded a pale peachy-orange color when mordanted with salt. All in all, I'm happy with the results and rather surprised by the parsley. You just never know what you're going to get, right? The Whipup 2011 Calendar is here and yours truly is the January calendar girl! I am so flattered and excited to have been included. 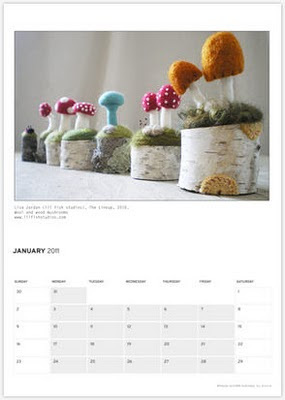 Not only is Whipup one of my must-reads, but January is my birthday month so it makes it extra exciting to see my little mushrooms lined up on that page. As you can see I'm in terrific company, not the least of which is my talented friend Sonia. You can buy a PDF of this beautiful inspiring calendar for only $5 here which comes in three different formats for you to print. You can also buy a pre-printed version through RedBubble. When you make your purchase you're not only getting a lovely calendar and showing your love for handmade, but you're also supporting Whipup's efforts to share the best original and exciting crafts around. If you're not familiar with Whipup, please stop by and have a look. It's a wonderful place to find inspiration and instruction. I've found it to be very helpful while planning what gifts to make the kids this year, and I'm sure you'll love it too. I am loving the goods I'm seeing in the Crafting For Ourselves group this week. 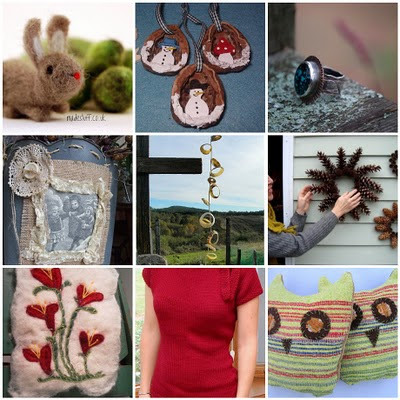 With the holiday season swiftly approaching, I'm hoping to see more of you sharing your handmade gifts and decorations. If you haven't joined us, please do! Thank you to everyone who has taken part in the group. It's nice to spoil yourself and your loved ones with your creativity, isn't it? What are your plans for the weekend? Anything creative? Snow always puts me in the mood for soup so last night I made up a batch of a rib-sticking, tasty West African peanut soup. I first tried a peanut soup last year at one of my favorite restaurants, Prairie Bay. I liked it so much I had to try making it myself. I found this recipe and I've only made very slight adjustments to it. I like making this soup because it's simple but yields a hearty soup that even my kids like. The chopped peanuts add a great texture against the creaminess of the peanut butter. The recipe makes a lot so I always have extra to freeze and it keeps wonderfully. Plus, the smell of the onions, garlic, and peppers cooking makes my kitchen smell like happiness. 1. Heat olive oil in a large stock pot over medium-high heat. Cook onion, bell pepper, and garlic about 5 minutes. Stir in tomatoes with their juice, broth, pepper, and red pepper flakes. Simmer, uncovered for 15 minutes. 2. Add rice to soup and stir. Reduce heat, cover, and simmer 25 minutes or until rice is tender. 3. When rice is cooked, whisk in peanut butter, stir in chopped peanuts, return to simmer, and serve. Do you have a favorite soup recipe to share? We've been a little under the weather here under the poplar and pine but I'm pleased to report that good health has returned and now we're under different weather, more snow. The wood stove is going and the kids are enjoying alternating playing in the snow and eating cookies in front of the fire. It's a cozy, quiet kind of day that I am thoroughly appreciating. I hope you and yours are enjoying good health and cozy times today as well. The dye jars in my window have been busy the past few weeks playing host to rotten vegetables, rotting wood, and discarded bits. Sounds like fun, doesn't it? I used beet greens, lichen, rotting wood that was stained green from a fungus (the actual fungus was long gone sadly), onion skins, and red cabbage. The results were varied, ranging from pretty to pretty uneventful. From left to right: undyed felted wool, rotting wood, beet greens, oakmoss lichens, yellow onion skins, red cabbage. and the results on wool roving from left to right: undyed wool, rotting wood, oakmoss lichens, onion skins, red cabbage. You might remember the other day I gathered the oakmoss from the trees that had fallen during our winter storm. I simmered it in a bit of water and put it and the water in two separate dye jars, one with wool mordanted with ammonia and one mordanted with alum. Both gave a very subtle result. The onion skins made a lovely coppery color and I'd really like to try this again with a different mordant. I had mordanted the wool with ammonia and added salt to the dye jar with these. Next time I'd like to try just alum. My favorite of the bunch was the red cabbage. I had a red cabbage in the fridge that was past its prime for eating. I chopped it up, put it in a small crockpot with a bit of water and let it simmer. When the color had mostly drained from the leaves I strained it and added my mordanted wool directly to the dye bath. I used ammonia as a mordant after reading that ammonia helped with the colorfastness when dyeing wool with red cabbage specifically. The color in the pot was a medium purple but after about 20 minutes the wool didn't seem to be picking much color at all. I decided to toss in about a tablespoon of alum and BAM! bright violet color that the wool picked up right away. When I rinsed and dried the wool the color that remained was a lovely steel grey-blue, not the violet color, but just lovely anyway. I liked it so much I had to make something with it right away. Using only the dyed materials, I made this mushroom for my daughter's room. I'm not sure what I'll try next. I have an entire log of Osage Orange in my workspace along with hickory bark, but I'm also eager to try pomegranate, if I can keep myself from eating them first. Have a colorful day, everyone. Yes, you read that correctly...wood not wool. Hubby mentioned the other day that he had read a recipe for weathering/greying wood so I had to try it out. Of course because I'm so precise and everything, I didn't measure or actually bother to read the recipe and opted to wing it. The deal is, you soak a pad of steel wool in vinegar overnight, remove the pad, dilute the solution with some water, then paint the solution on your wood. So this is what happened. I tried it out on a piece of oak and a small piece of spalted birch. You can see that the spalted birch definitely turned grey, compared to its non-weathered counterpart. The oak turned.... indigo. OK, that surprised me. This is what they look like after I hit them with a little beeswax. The indigo looks nearly black now. Interesting, no? I'm not sure what I'll use this effect on, but it's a nice thing to have in my bag o' tricks. Since I had the soaked steel wool pad hanging around I decided to wrap it in a piece of linen and throw it in a dye jar with some salt water. I figure eventually it will rust and with luck with make an interesting pattern on the fabric. muahaha....welcome to my laborrrratory. I'll have the results of my latest dye attempts to show you this week also. Some were pretty cool and some were pretty meh. More on that later. Have you done any tinkering lately? Yesterday's late afternoon sun was hitting my dye jars so beautifully that I had to snap a few photos. I'll share the results soon. I can tell that the dyeing is very subtle on these, but I am enjoying the suncatcher effect during the process. We've had another change in schedule around here with my husband starting a new job this week. Blogging, shop updating, and well, everything else might be a little sporadic while we try to get used to the changes. I hope you'll bear with me. In my working time I've been working on small portable projects, namely some new brooches (that I love) and tiny canoes like I showed you yesterday. I'm looking forward to sharing more in the coming weeks.